Can You Cook Sausage When It Is Still Frozen? 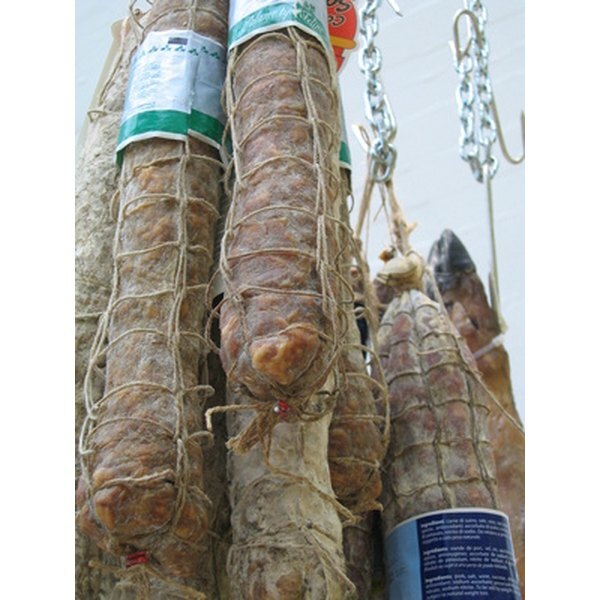 Dry-cured salami lasts longer than cooked or fresh types. 1 Can You Cook Sausage When It Is Still Frozen? Salami is a type of sausage traditionally associated with Italian cuisine. The length of its shelf life depends on how the sausage is initially made and how it is subsequently stored. To make salami, ground meat and fat are mixed with spices and flavorings and packed into natural casings. The length and circumference of the links is at the discretion of the sausage maker. Often seen hanging from the ceilings of Italian markets and butcher shops, dry-cured salami requires no cooking and is safe to consume upon slicing. If refrigerated, this type of salami can last from 30 to 45 days. Fresh salami, which requires cooking before eating, and precooked salami are more perishable than dry-cured varieties and should be consumed within a few days of purchase. After cutting, tightly wrap it in butcher paper and store it in the back of the refrigerator where it is coldest. Avoid wrapping it in plastic wrap because the resulting moisture increases bacteria growth. VolpiFoods.com: When Does Salami Spoil? LifeInItaly.com: When Does Salami Spoil? Is It Safe to Cook in Cans on an Open Flame?